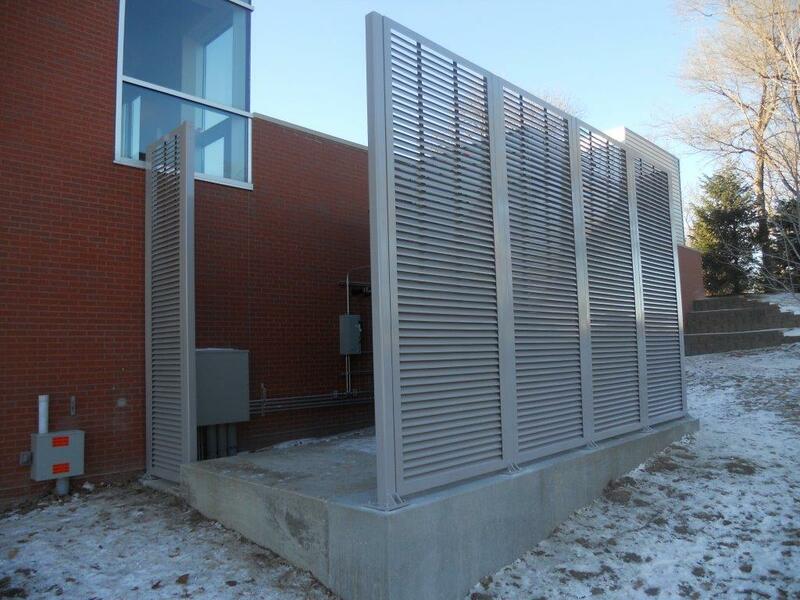 PalmSHIELD has been working with engineers for over twenty years in assuring that our louvers perform structurally and do not interfere with the mechanical performance of the equipment the louvers were intended to screen. Mechanical equipment may include compressors, condensers, chillers, HVAC, compactors, breakers, meters, containers, generators, and like-kind equipment. Each one of these unique pieces of equipment has recruitments specific to the volume of air surrounding the equipment and the exchanging of that air which allows for dispersing heat. PalmSHIELD mechanical equipment screen has been engineered to meet the standard in openness for maximum air flow while still maintaining 100% direct visual screening. The percentage of openness is the actual openness between the louvers over a specific area. The smallest opening between two louvers is the greatest factor impacting the percentage of openness. 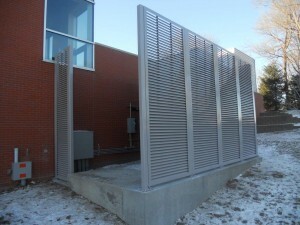 PalmSHIELD louvers typically louver opening based on 100% direct visual screening is 2 ¼” In other words, with 4” tall louvers spaced 3 ½” on center, the smallest opening is 2 ¼”. Boiled down, every 3 ½” of travel, there is a 2 ¼” opening. This ultimately translates into approximately a 64% free area. PalmSHIELD has been designed and engineered to meet these codes. Through measured calculations, PalmSHIELD’ s louvered panels with an 80% opening has a horizontal load of 22 psf. This wind load calculation is based on 90 mph winds which complies with the 30psf load requirement on solid building surfaces. These results are based on a risk factor of I, an importance factor of .87, a 8′ height and post spacing at 8′ on center. These load calculations are used in selecting the design of all of our mechanical equipment screening. From these calculation, we can determine post design, material selection and post spacing. By applying the load per quare footage of the panel size; we can properly estimate these specifications on a per case basis. It must be stated that these are only estimated loads because loading will vary exponentially based on the height of the panels. Not all wind loading is equal top to bottom of the louvered panel. For actual engineered calculations, each system must be independently engineered by a registered engineer within the jurisdiction it will be installed. This level of engineering is not included in the standard PalmSHIELD quote. If local stamped engineering is required for your system, please indicate so at time of quote. We will contact a local engineer in the respective jurisdiction and work directly with them to provide the necessary calculations. It is up to the owner or project engineer to select the type of anchoring system for anchoring our PalmSHIELD plated post design to your structure. We have worked with engineers across the United States to attach our PalmSHIELD product to structural steel and adjoining structures for rooftop installations. However, the majority of our installations are mounted to the top of concrete surfaces. PalmSHIELD uses a very wide ¾” base plate design that is gusseted to the posts and welded in accordance with AWS D1.2 requirements and related certification. This large plate design is intentional to allow the customer to use a wide variety of anchoring options. The use of this large plate spaces the anchor holes more than 7 inches apart. By spacing the anchors this distance, it prevents overlapping of the tension placed on the concrete by each anchor. When installed, concrete anchors place tension against the adjoining concrete under a load. The tension begins to diminish the farther away you get from the center of the anchor. Assuming you have adequate concrete of at least 4000 psi, the load can be predicted by the anchor manufacture relative to the area of concrete impacted by this tension. If concrete anchors are installed too close to one another, this loading is overlapped and increased exponentially thus potentially causing the concrete to fail or sprawl. Consideration should also be given to how far the anchor is installed relative to the edge of the concrete. If there is not enough concrete from the center of the anchor to the edge of the concrete to absorb the tension of the anchor under a load, the concrete may fail. Anchor manufactures call this area around an anchor a sprawl cone with the larger end of the cone closer to the top of the anchor. When two anchors overlap or the cone reaches to the edge of the concrete, there is concern that the anchor may fail. PalmSHIELD is not recommending any anchor, anchor spacing, depth or edge spacing. We are simply offering some solid advise to our customers that these are important considerations that should be properly engineered. If notified at time of quote request and provided with the site specific engineering requirements, PalmSHIELD can provide you with engineering that will determine your specific anchoring requirements during the submittal process. On a site specific basis, PalmSHIELD can offer jurisdiction specific engineering working with engineers who are certified in that jurisdiction. As our PalmSHIELD product has been stamped for approval in multiple installations, we work seamlessly with engineers to meet your requirements.